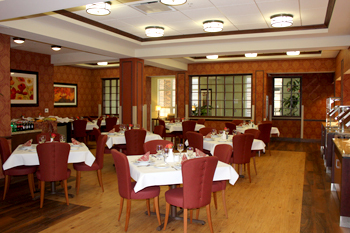 (October 4, 2011 – Niles Illinois) SIR Management facility, Regency Rehabilitation Center in Niles, Illinois, has been named Best in Category 2011 by “Long Term Living” Magazine for their newly-renovated dining facility. Once an “easy-to-maintain” somewhat Spartan cafeteria, the new dining room now calls to mind a five-star restaurant. Elegant fixtures, warm rich colors, wall coverings and cozy flooring selections, and high-quality furniture set off the custom lighting and artwork selections. Regency Rehabilitation Center has proven itself to be a leader and innovator in providing outstanding health care services to the greater Chicagoland area. For the past three decades, Regency has been offering a complete line of health care options which enable the elderly to live as independently as possible, thus providing them reassurance that they will receive the level of care suited to their individual needs. Healthcare services include skilled and intermediate nursing care, specialized Alzheimer’s unit, dialysis services, occupational, physical and speech therapy in a beautiful, family friendly environment. Regency has always been at the forefront in utilizing the latest technology available for providing care and comfort to its residents. SIR Management provides expert consultation in Long Term Care, through a network of thirteen nursing facilities throughout the Chicago Metro area including Byron, Decatur, Rockford and Rock Island. SIR Management services include Rehabilitation, Advanced Acute Care, Physical Therapy, Occupational Therapy, Speech Therapy, Alzheimer’s/Dementia Care Services, On-Site Dialysis, Hospice Care, Bariatric Care, Respite Care and Adult Day Care.